OXFORD, Miss. – In an effort to establish uniform justice in criminal cases, the Sentencing Disparity Task Force, authorized by the 2018 session of the Mississippi Legislature, is working to determine whether some judges sentence some criminals more harshly than others. Phillip Broadhead, a University of Mississippi professor of law and director of the Criminal Appeals Clinic at the School of Law, assisted the task force by putting together a report of statutory guidelines from other states and sentencing data across the state’s 22 judicial districts. Broadhead presented important policy considerations and sentencing data from the Administrative Office of Courts to the task force’s first meeting in July. The data Broadhead presented included statistical information of individual sentences over the last decade for 10 different crimes: armed robbery, sexual battery, manslaughter, possession of a firearm by a convicted felon, uttering a forgery, sale of a controlled substance (other than marijuana), sale of a controlled substance, felonious child abuse, receiving stolen property and grand larceny. Early this year, a legislative committee working in conjunction with the task force is to provide data policy decisions on detention and sentence lengths for all incarcerated people in Mississippi. The data will be reviewed by the state House and Senate to determine whether the need for reform includes statutory guidelines for sentencing. 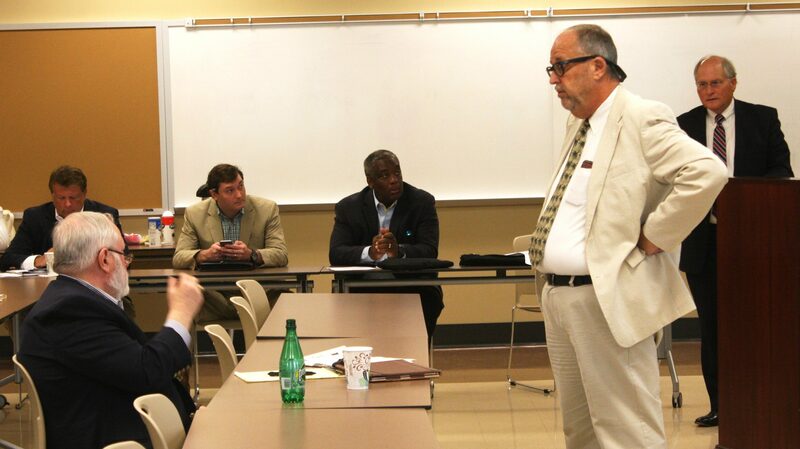 In consideration of the adoption of state guidelines, Broadhead presented Mississippi Supreme Court Chief Justice William L. Waller Jr. and the task force with previous findings from the National Center for State Courts. In a 2006 survey, the NCSC found that most Americans prefer a tougher sentencing approach to violent offenders. The survey determined that Americans think that prevention and rehabilitation methods are more important and more effective than enforcement and punishment for nonviolent offenders. The survey also found that current sentencing practices are viewed as unfair to minorities, non-English speakers and low-income offenders, while giving preferential treatment to offenders of higher socioeconomic status. A few states, including Maryland, Missouri and North Carolina, have sentencing guidelines in place. The task force of 15, which includes law enforcement officers, prosecutors, public defenders, legislators and staff members from the Mississippi Department of Corrections, will review the data and present recommendations to the Legislature. For the state to adopt sentencing policies and practices, state courts need a baseline sentencing structure that can be personalized to each offender, and there should not be a voluntary implementation of the guidelines, which results in disparity in sentencing among individual judges, said Broadhead, who has 35 years of practice experience as a criminal defense attorney. With more than 19,000 people incarcerated in Mississippi, legislative solutions are needed to prevent prison overcrowding and to assist offenders in re-entering society so they will be less likely to return to prison, he said. “The fact is, we have 2.6 million individuals incarcerated in this country,” Broadhead said. “A person who went to jail in 2005 doesn’t even know what a smartphone is, much less how it works. Additionally, it costs about $87 a day to house each incarcerated person in the Mississippi Department of Corrections system. “We need to strongly consider our approach to sentencing to not only prevent disparity, but to also provide them skills before their release from prison so these individuals are less likely to become repeat offenders,” Broadhead said.